This historic farm was purchased in the 1930s by William R. Allen. During the last eighty years, three generations of Allens have resided on this quaint, rustic farm. To honor her family’s legacy, Karen Allen Rogers passionately restored The Barn to its original beauty, and in the process has given the community of Rock Falls a historical landmark. The 26-foot, vaulted ceiling has exposed beams that, along with original wood siding and original barn doors, make for a truly charming, rustic setting for your special day. Our barn also has a balcony with stairs leading down to a platform that is ideal for photographs, receptions, outdoor ceremonies, or any other wedding needs. 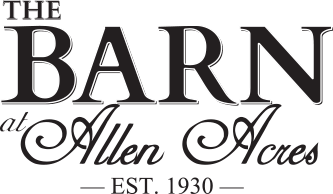 Relax and enjoy your wedding weekend event by staying in the 1920’s farmhouse that is included with your wedding booking at The Barn at Allen Acres!